The 2019 budget was developed with a focus on Becoming Beloved Community. The Budget Committee revised its budget application in anticipation of the diocese and General Convention adopting these principals. The budget also aligns itself with a Vision Statement recently adopted by Diocesan Council. This vision statement is to guide our diocese in discerning its mission priorities and direction; the budget also reflects and aligns with this vision. Presiding Bishop Michael Curry has lifted up the term “Jesus Movement” as a path forward for our General Convention. We’re following Jesus into a loving, liberating and life-giving relationship with God, with each other and with the earth. Those applying for financial resources were asked to keep the Jesus Movement in mind, and asked to consider the three Jesus Movement priorities adopted by General Convention. These priorities are evangelism, reconciliation and creation care. This budget includes programs and ministries that address these global concerns. In aligning the budget to the diocesan vision statement, General Convention goals and initiatives of the church and wider community, this budget expresses the mission and ministries of the Diocese of Southern Ohio. There are big changes in the 2019 budget. 2019 will be the third year of the current mission share formula. In absolute dollars, mission share has increased $183,773 over the previous year. Last year, the budget process experienced a tremendous hardship with the mission share decreasing by almost $100,000. Over a two-year period, the mission share has increased only $84,788. The 2019 budget includes funding for this new ministry. Started in 2018, the La Iglesia Episcopal del Espiritu Santo is the investigation and development of a Latino church plant in the northwest Cincinnati area (Forest Park, Ohio). This initiative has received a grant from the Domestic and Foreign Missionary Society for $100,000. The 2019 budget includes funding from both the mission share budget and the William Cooper Procter fund for this new ministry start. Putting this understanding into practice is the impetus behind the collaboration efforts now being undertaken. The efforts of the staff of each organization will be more effectively executed with collaboration. For example, the additional resources that each organization can bring to the other, whether tangible or intangible, will enhance communication initiatives, human resources practices and facility management procedures. Sharing resources as it relates to operations will also improve our individual capacities to demonstrate best practices that can be replicated for the benefit of other churches. As many parishes have experienced transition, the diocesan transition office has evolved due to staffing changes. A new model continues into 2019 with the creation of regional transition consultants. These regional consultants are under contract with the bishop’s office to assist congregations in finding new clergy leadership. This could be a traditional rector search, priest-in-charge assignment or part-time clergy placement. 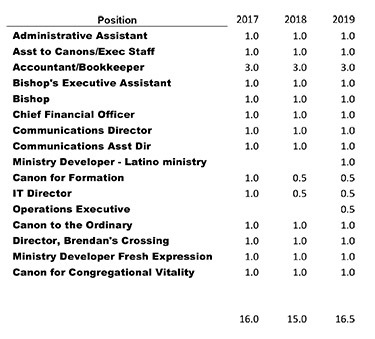 The transition consultants will report to the Canon for Congregational Vitality and Transition and be assisted by staff within the bishop’s office. Telling the Truth about the Church and Race: What things have we done, and left undone, regarding racial justice and healing? Proclaiming the Dream of Beloved Community: What does Beloved Community look like in this place? Practicing the Way of Love: How will we actively grow relationships across dividing walls and seek Christ in each other? Repairing the Breach in Society and Institutions: How will we participate in repair, restoration and healing of people, institutions and systems? The 2019 budget includes funding for the Becoming Beloved Community initiative. This funding is lived out in two ways. First, programs and formation: The commission will put on several events throughout the year. Second, the task force asked for funding to grant to other parishes and entities that live out Becoming Beloved Community. This grant funding will assist them in doing that ministry. The task force is developing an application. Every budget includes the cost of operations. For the diocesan budget this area includes staff, building maintenance, repair, and operations. Insurance, utilities, supplies, software, and professional development are included in this area. Communications, information technology, and finance are major back office functions of the diocesan operating budget. The budget includes increases for health benefits and a 3% cost of living adjustment (no COLA in 2018). Retirements, resignations and program changes impact staffing. For the bishop’s office this occurs annually. Significant changes have been made in staff assignments. These changes often occur during the fiscal year. This staff report represents staffing at the beginning of each budget year (what is planned in the budget). The budget reports full compensation costs. The budget also reports offsetting income for positions shared with the Cathedral. General Convention set forward an annual request for funding from diocese. Southern Ohio consistently provides funding to DFMS at the budget amount required at General Convention. The 2019 budget includes the full ask from the church at $435,106. The Convention or Mission Share budget totals $3,196,950 for fiscal year 2019. The total consolidated budget, which includes the WC Procter fund, totals $6,039,034. The full budget was adopted by Diocesan Council and the mission share budget is presented to convention for approval.